Forget about purple and the jewel tone colors. My go to color this season is grey. It's the new black for me. Like black, grey is an excellent background color and great for pairing bright colors with. And with it's many shades, it's a little more versatile than black. Check out a couple pieces below to see what I mean. Great cardigan that will work superb as a layering piece. 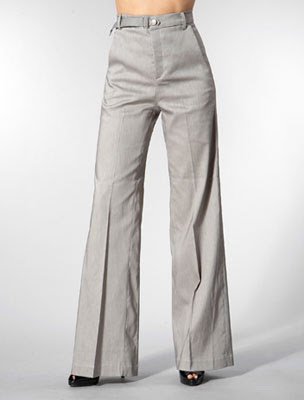 Pair these wide leg trousers with a stark white shirt for a bright winter look. A color cardigan, button down shirt, and thin belt would look great with these pants as well. 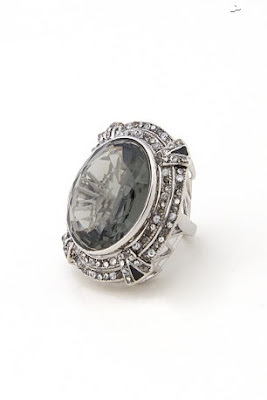 This ring is super hot! Drama indeed when you complement your winter outfit and/or evening attire. Make sure this is the only ring that grabs attention. No need for more. Let's don't leave out the darker shade of grey. I like to see this shade paired with bold, unusual colors. That's why I picked this picture above. Don't be scared to style yourself outside the box every now and then. Just make sure you're staying true to yourself (your age, your shape, etc.). I can see this wool skirt paired with tights, a moto jacket, and peep-toe booties. A light cashmere sweater will soften the look beneath the moto jacket. Don't you just love how we're able to make skirts and dresses wearable year round! This process is called "winterizing". I love the style of this peep-toe bootie and this shoe can be worn with almost everything this season. However, I would hold back from experimenting with evening wear. I just don't believe that will be a good look. LOL! Awesome ruffled shirt. Go casual with a pair of skinny/straight leg jeans tucked into some knee high boots, or go dressy by pairing with black trousers and high-heeled pumps. I love how Grey Ant has maintained its cool during the premium denim fall out. La Rousse is Seattle has a bunch on sale. Even the new styles including the overalls. Really cute. Check Shoplarousse.com out!